The advanced Snow Peak LiteMax stove is the world's lightest backpacking stove at 1.9 oz with an amazing output of 11,200 BTU's. 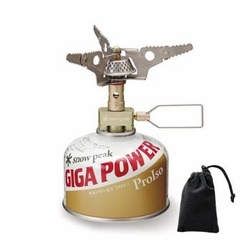 From the company that revolutionized backpacking stoves with the tiny yet powerful GigaPower Stove, the Lite Max stove sets the bar even higher. Size: 3-7/8"diam x 3-1/2" x 3 "